The skin is designed to be as extensible as possible, and includes detailed documentation of the skin code. The skin also includes instructions for integrating the picker into your own suite. You will also want to configure baseColor and finishAction as well. A common practice might be to set baseColor to the current value of the color you're changing, and set finishAction to write the resulting color into an external .INC file. ; To incorporate ColorPickerPlus into your suite, you can either change these options directly, or you can use !WriteKeyValue bangs from another skin to change these values. ; There are some other values that you could access, if for some reason you wanted to. 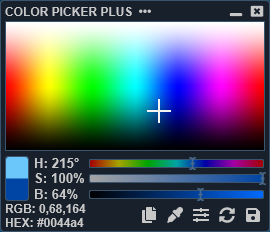 To see what colors you can retrieve, study the ColorPickerPlus.lua script. This looks amazing, thanks you!